Boys' ski pants come in a variety of styles and designs, depending upon what your son's needs are. Why should your child wear ski pants instead of regular pants, like jeans or cords, or jogging pants? Well, obviously the first reason is for warmth. Ski pants are typically designed to protect your child from the winter elements while he is outdoors. While of course ski pants were created with skiing in mind, boys wear them outside for a variety of reasons, including snowboarding, other winter sports, or simply playing in the snow. Are all boys' ski pants created equally? Of course not, so consider the following points before you purchase ski pants for your child. Waterproof-This should be an essential characteristic of the pants you choose. Playing in the snow means lots of wet clothes if they aren't waterproof. Don't skimp on this feature! Windproof-Most waterproof material is windproof as well, but be sure and check the tag to determine that the pants you purchase can withstand the sharp winds of winter. Insulated-While the pants you purchase may be waterproof and windproof, they may not be insulated. Unless you plan on putting another layer or two under your child's ski pants, purchase pants that are well insulated for additional warmth. Even with insulated ski pants, you'll want your child to wear insulated underwear, like Under Armour, as well. Fit-Purchase pants that are loose enough to accommodate insulated underwear. While you need to look at the waistband fit, you also need to consider the length. Pants that are too long will become frayed quickly if they drag the ground. In the same respect, pants that are too short may not provide adequate protection to the lower legs. 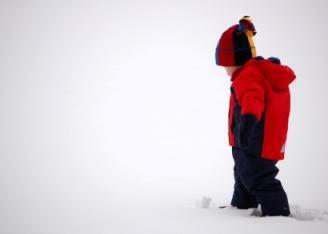 For the best fit, have your child try on the ski pants with his insulated underwear and boots or shoes. Costs-Kids' ski pants can be expensive, but there are ways to cut costs. Consider purchasing used pants. Unless they've been worn a lot, they may be just like new. Check out consignment shops and your local classified ads for deals. For new pants at a reduced price, consider purchasing at the end of ski season when you may find drastically reduced markdowns. Look for reinforcement material in stitching in the knees and lower legs, areas of the body that hit the ground quite often in the snow. If you like pants with suspenders, be sure the suspenders are easily adjusted. The same goes for waist belts. Look for lining that wicks moisture away from the skin and is considered "breathable". Look at the degree of insulation-How thick is the fleece? How are the pants designed? Will they offer flexibility for those snow-covered inclines? What brand do you prefer? Patagonia, The North Face, Columbia, Obermeyer, Spyder, Roxy, or Quiksilver? Finally, the type of ski pants you purchase for your child may depend on the activities he participates in. Is he a competitive skier? If so, then talk to his coach about the best ski pants available for his particular sport. Is he a kid that simply loves the outdoors? You'll still want to purchase ski pants that are waterproof and insulated, but you don't have to rush out and buy the most expensive ski pants available. The most important point to consider is the fit of the pants. If your son will be outgrowing them soon, then consider purchasing pants slightly larger than what he wears at the moment. Once your child puts on his pants, he's ready to hit the outdoors and have some fun!